VarageSale’s Chief Mom and Hubby put their heads together yet again to create a pretty fantastic surprise for their members. And for the past few months, our developers have been hard at work building VarageSale’s little sister, VavySitter. 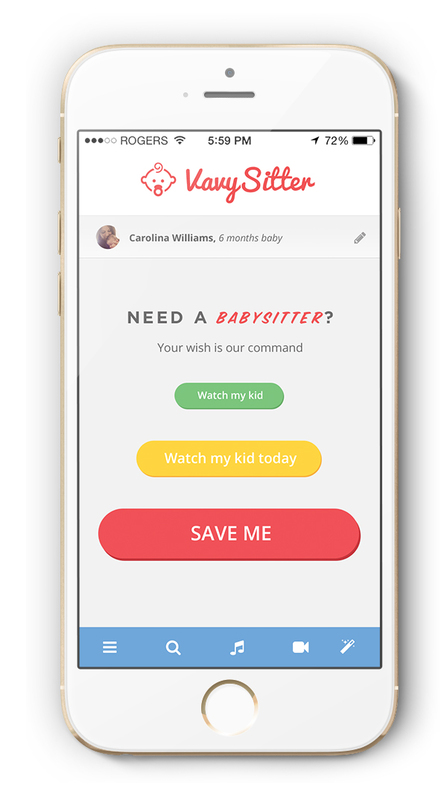 The latest app for busy moms and dads, VavySitter is the safe, easy way to find a local babysitter the moment you need one. For immediate, urgent support, choose the big red “SAVE ME” button and you’ll be rescued right away. Once you’ve made your selection, you can browse a community of available babysitters in your area. Read through their profiles to decide which fee, personality and schedule matches yours. All of VavySitter’s babysitters are carefully selected through an in-depth pre-screening process. These “mother’s helpers” come with a babysitting certificate, first aid training and a host of fun activities for the kids. And the app’s messaging and scheduling features will help ensure prompt responses and reduce no-shows! “VavySitter is to babysitting what VarageSale is to buying and selling—revolutionary. And a little magical,” beams Ben Yoskovitz, VarageSale’s VP of Product. The magic happens when you select ”SAVE ME.” You need that babysitter right away… right?! Not a problem. Using the latest drone technology, the “vavysitter” of your choice will be teleported to your doorstep—yup, at the push a button. Seeing is believing.